The PT-P750W labelling machine can be used on Windows and Mac platforms, and even mobile devices to create labels over a wireless network. This makes the PT-P750W an ideal group label printer for industrial and business environments. 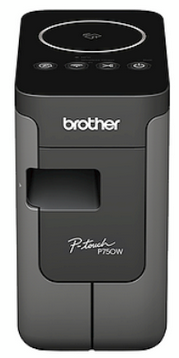 This versatile label maker can print labels created on your compatible Apple iOS and Android mobile devices using the free Brother iPrint&Label app. The PT-P750W is NFC-compatible, which lets users “touch to connect” to quickly establish wireless contact with NFC-capable devices.